ATAD‘s goal is to enable qualified students from the Rochester area to visit partner cities. ATAD makes no profit on your exchange experience, which is one of the chief reasons that our “Americans Overseas” programs are already significantly less expense than most sponsoring organizations. There are many ways an enterprising student can raise funds for his or her exchange experience. Some ideas are included below. However, before making any effort to obtain funds, be sure to thoroughly research the area to which you will be going and the principles of the exchange program. People and businesses are more likely to support those who are truly knowledgeable and enthusiastic about the intent of their fund raising than to support someone who is just asking for a handout. One tip is to also be sure to immediately send a thank you letter if you receive funds from any source. Do you have any other ideas? Be sure to let us know so we may share them with future students. Write a letter to the president or community affairs office of local companies and organizations asking for contributions. Many already have funds set up to assist students and to support Rochester’s Sister Cities. Hold a garage sale. Ask your friends and relatives to donate items. If you are going for a semester or year, ask your guidance counselor about scholarships available for studying abroad. If you do not already have a job, apply for one today, or earn extra money through baby sitting, yard work, etc. Just working one half day on the weekend can provide significant savings by the time you go overseas if you save this extra money. Make a decision on your priorities; perhaps you don’t need to spend as much money as you are used to. For example, instead of going to the movies this weekend, go for a bicycle ride with your friends and save the extra money from your allowance. Ask relatives to give you money instead of gifts for holidays and birthday. Consider organizing a fund raising activity such as a bake sale, car wash, community clean up, concert, play, or selling items that you have made. BE SURE to immediately send a thank you letter if you do receive funds from any source. Financial assistance is available to all qualified students based on need. The application deadline for need-based assistance is December 31st of each calendar year. Awards range from $250-2000. All financial aid applications, information, and awards are kept in strictest confidence. ATAD may award one or more scholarships in honor of previous ATAD Board members and friends. The scholarships range from $250-$500 and are presented to students who portray the values of those honored as demonstrated in their application and regional interview. Students do not apply for these scholarships. 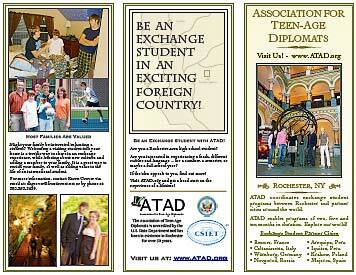 ATAD may also offer a full scholarship based on excellence to enhance intercultural opportunities for the community. This requires an additional application process. Check with your school representative or contact us about scholarship availability. Parents are encouraged to check with their place of employment. Several companies in the area provide assistance and awards to children of employees for extended education and intercultural exchanges.